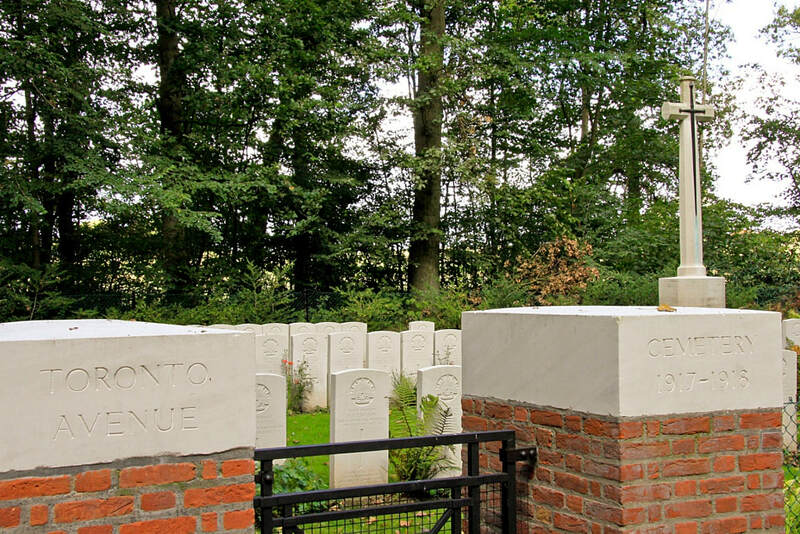 Toronto Avenue Cemetery is located south of Ieper off the N365 rue de Messines. From Ieper town centre take the Rijselstraat and follow this road to the roundabout with the inner ring. At the roundabout go straight over and keep following the main road in the direction of Mesinnes. 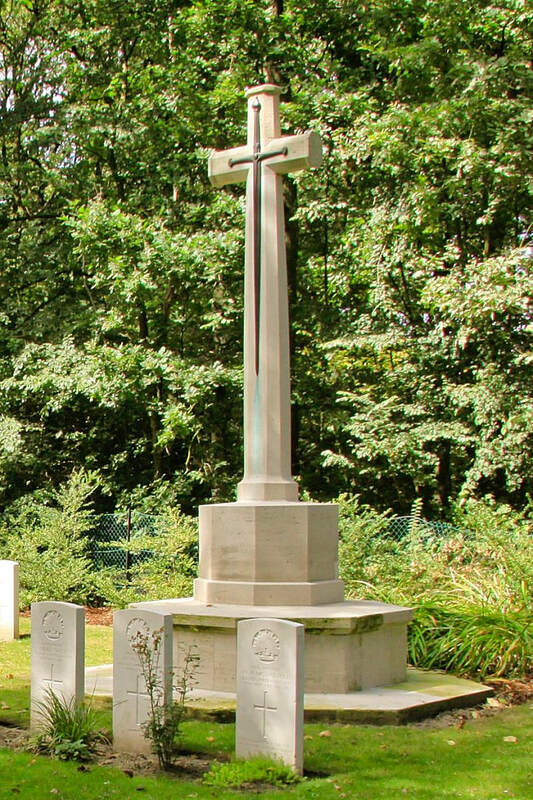 Cross the railway and follow the road to the roundabout in Voormezele; at this roundabout take the second exit in the direction of Mesen/Messines. Follow the road through Wijtschate and through Messines towards Armentieres. 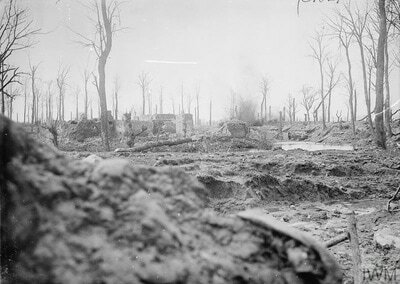 Approximately 2 Kms after Messines there is a turning to the left called Section St.Yvon; at this turning there are several Commission direction signs. 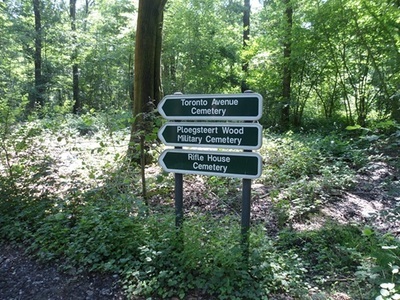 Turn left along Section St.Yvon and follow to the first cemetery on the right. Turn right past this cemetery and keep following the track to the entrance to the woods. Toronto Avenue Cemetery is located in the woods. Please note, motor vehicles are not allowed in the woods. Follow the track into the woods and at the T junction turn left. 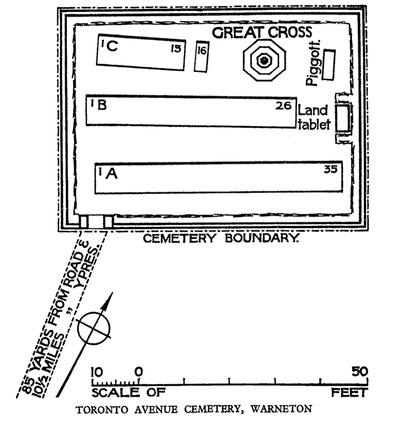 The cemetery will be found at the end of this track. This cemetery is located in the wood at Ploegsteert, and access is only possible via a track in the woods to which motor vehicles are not allowed - a post is in position preventing vehicle access. 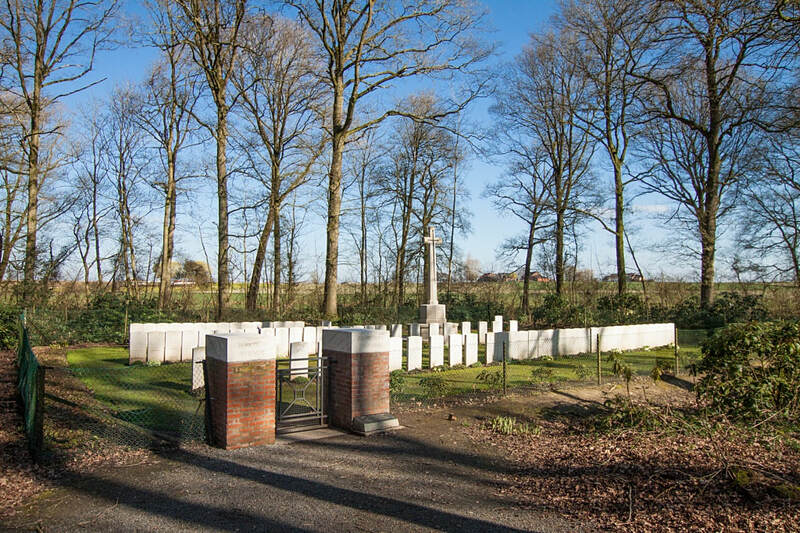 If disabled visitors or wheelchair users cannot get to this cemetery without being driven by car, they should contact the office of the CWGC in Ieper well in advance of their visit - Telephone (057) 22 36 36, so that arrangements can be made with our local staff to open up the track. 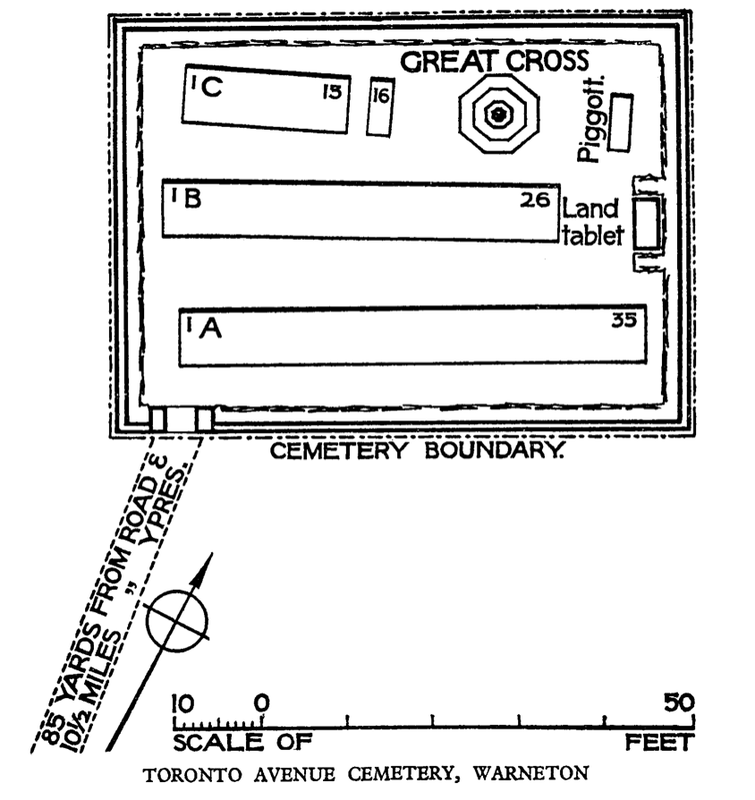 Wheelchair access is possible once at the cemetery via the main entrance of the cemetery. 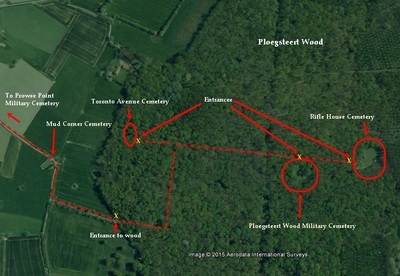 Toronto Avenue Cemetery was named from a Communication Trench in Ploegsteert Wood, in which it is located. 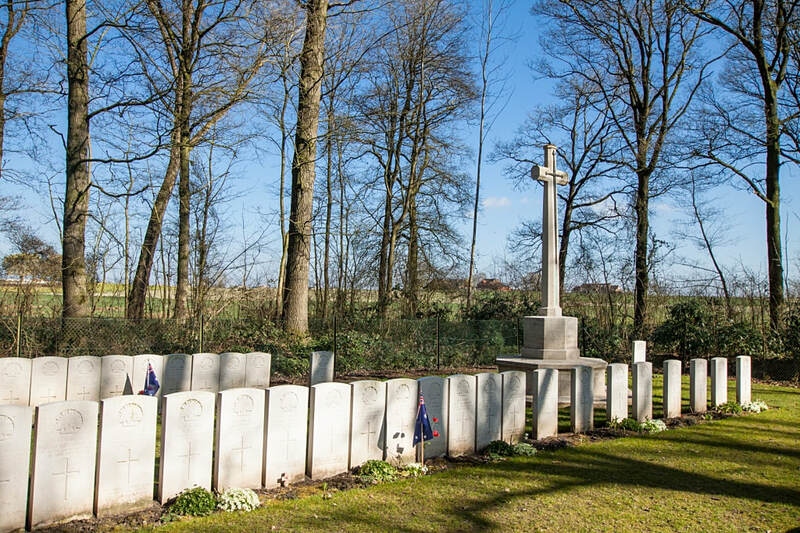 The cemetery contains the graves of officers and men of the 9th Brigade (3rd Australian Division) who died in the Battle of Messines between 7 and 10 June 1917. 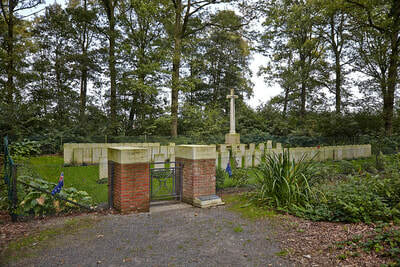 The cemetery contains 78 First World War burials, two of them unidentified. 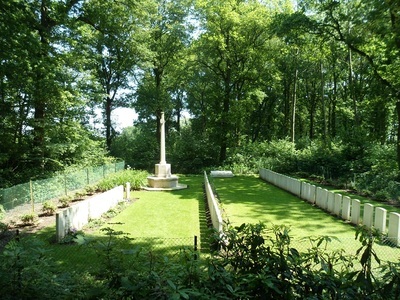 The cemetery was designed by G H Goldsmith. 7th June 1917, aged 23. Son of William Cawkwell and Elizabeth Miller, his wife, of Swan Hill, Coolatai. Native of Tooloona, New South Wales. A labourer prior to enlistment, he embarked with C Company from Sydney aboard HMAT Marathon on 4 May 1916. 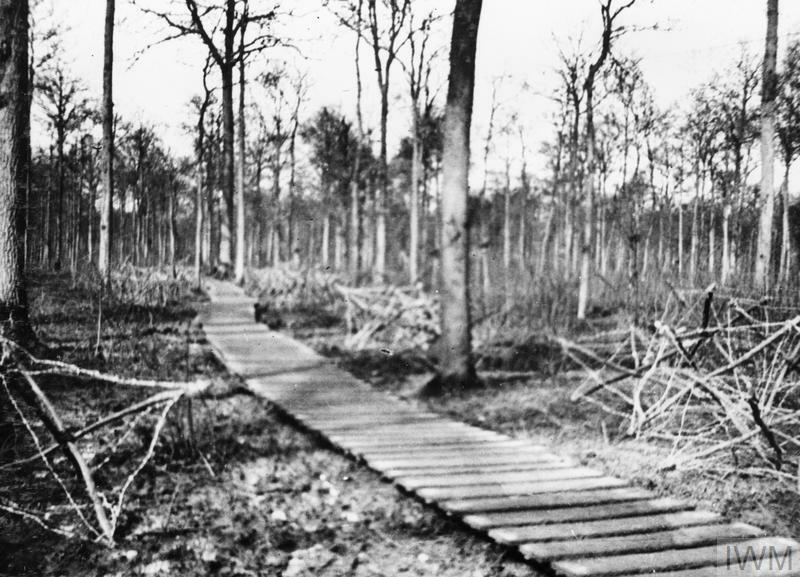 After further training in England, L Cpl Cawkwell proceeded to France with his unit in November 1916. 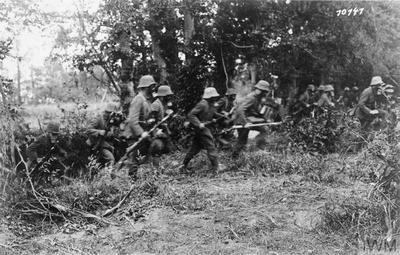 He was promoted to the rank of Lance Sergeant (L Sgt) in April 1917 while serving in Belgium. 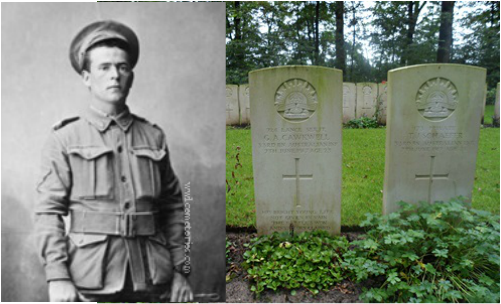 During the first day of the battle of Messines, L Sgt Cawkwell was killed in action on 7 June 1917, aged 23. 7th June 1917, aged 31. 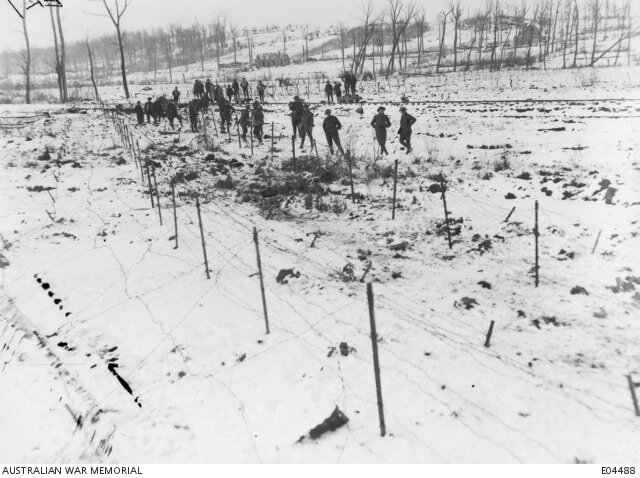 Prior to enlistment he had been a bush labourer around Sandy Flat/Bolivia, NSW. Eldest child of Henry (Joe) and Mary Jane (Polly) Halliday. 8th June 1917, aged 30. 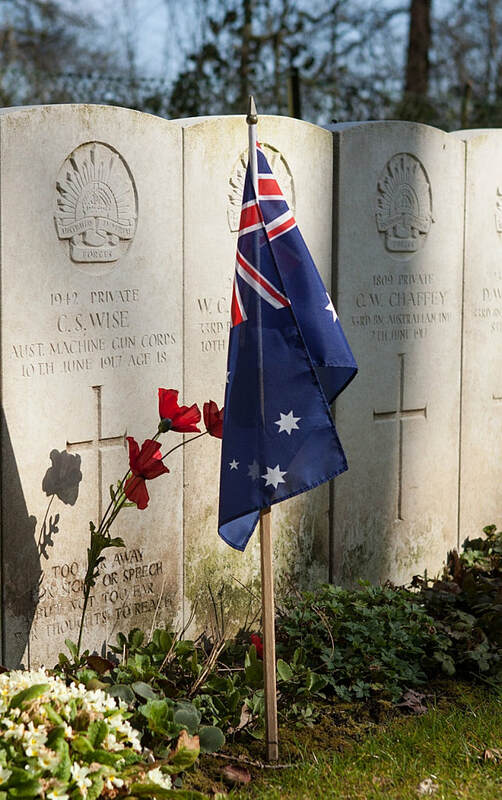 A carpenter prior to enlisting in January 1916, Pte Hobbs embarked from Sydney with the 3rd Reinforcements on board HMAT Anchises (A68) on 24 August 1916. He was killed in action at Messines, Belgium, on 8 June 1917. He was 30 years of age. 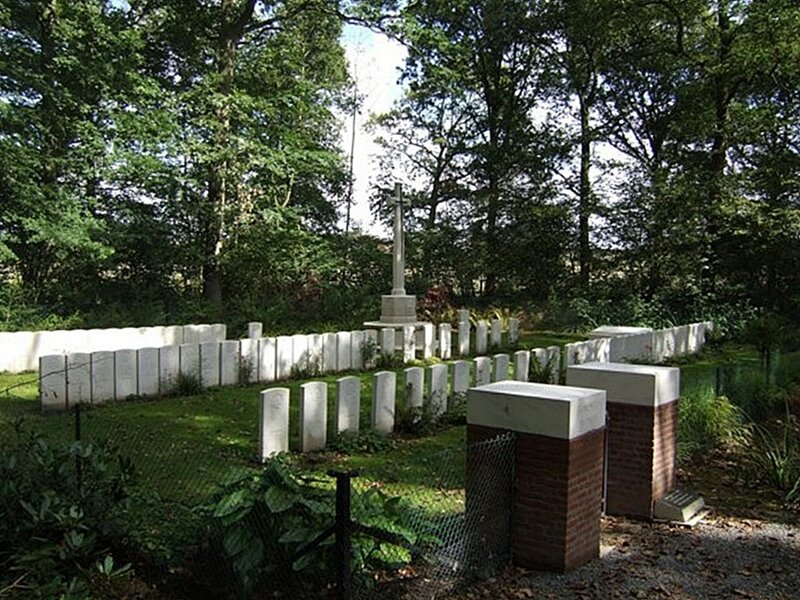 His brother 3003 Trooper Arthur Ernest Hobbs, 1st Light Horse Regiment, died of illness in Egypt on 25 October 1918, he is buried at the Kantara War Memorial Cemetery. 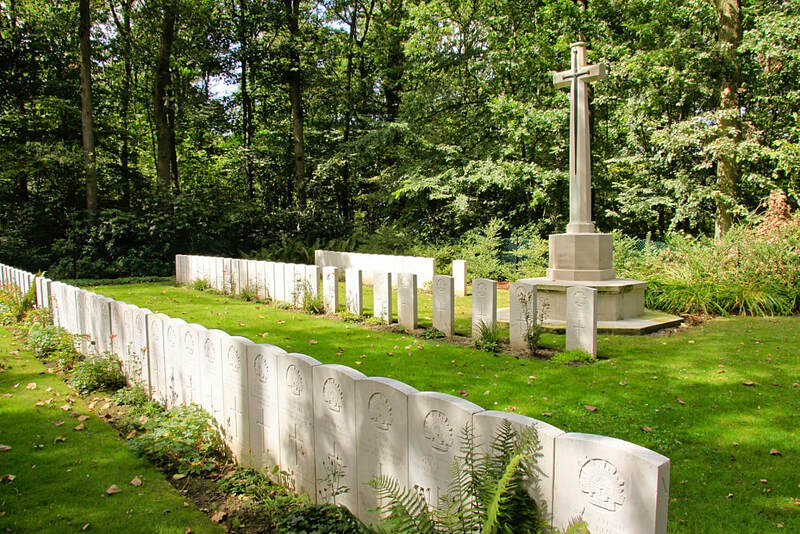 7th June 1917, aged 20. Son of George Henry and Ada Clara Hoswell, of Southern Cross, Forbes, New South Wales. 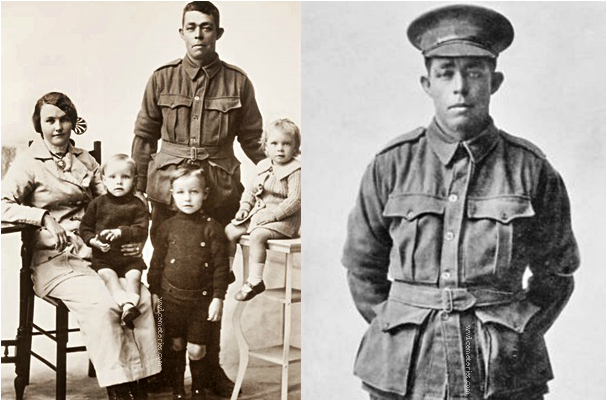 A labourer prior to enlistment, Hoswell embarked from Sydney with the 13th Reinforcements aboard HMAT Kyarra on 5 June 1916. 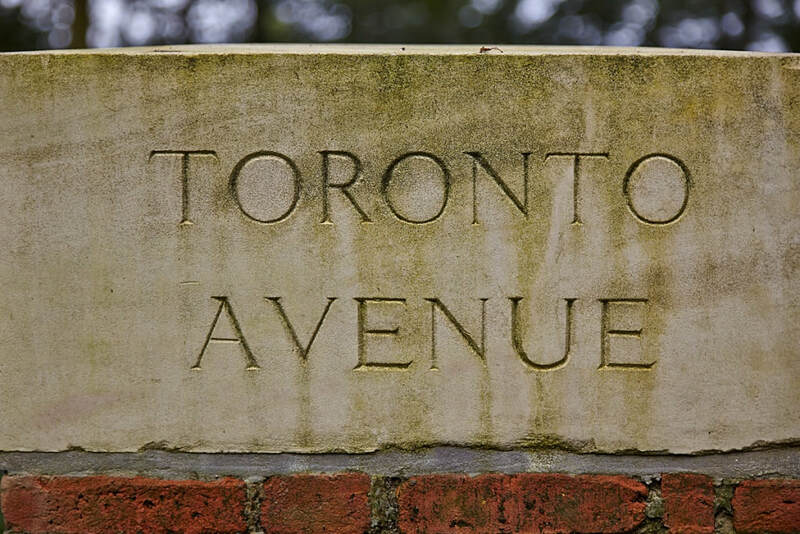 Later transferring to the 33rd Battalion, he arrived with his unit at the Ypres Sector of Belgium in mid 1917. 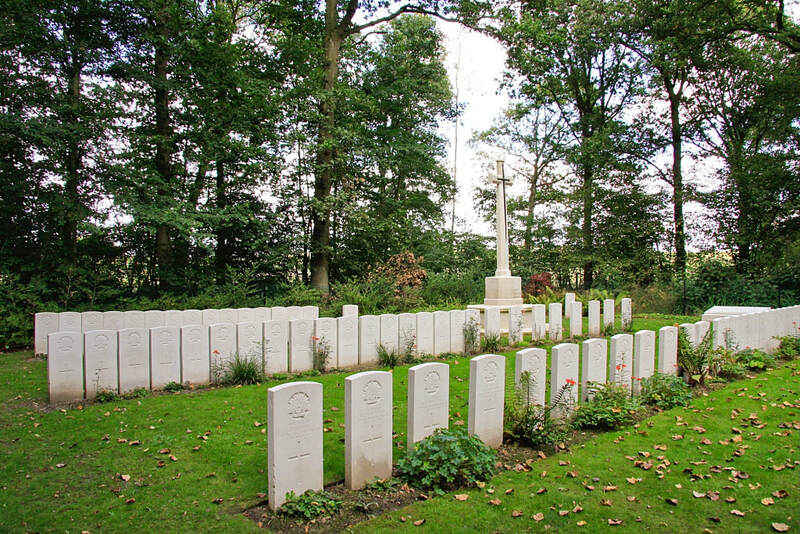 Pte Hoswell was killed in action on 7 June 1917, the day the battle of Messines was launched. "He was in "D". Coy., from New South Wales and single. 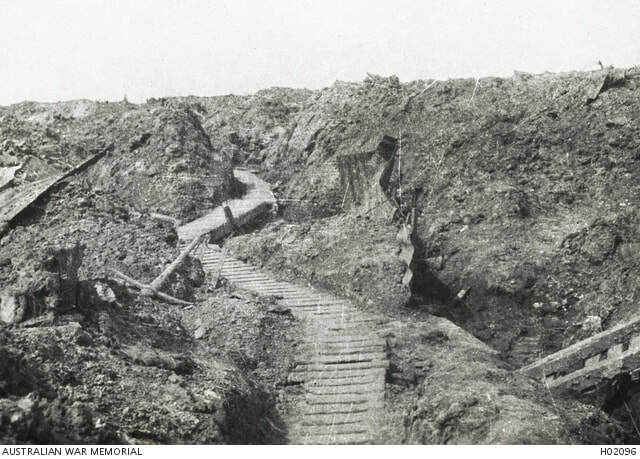 He was killed outright by a shell at Messines in the trenches in the afternoon, being hit all over the body. 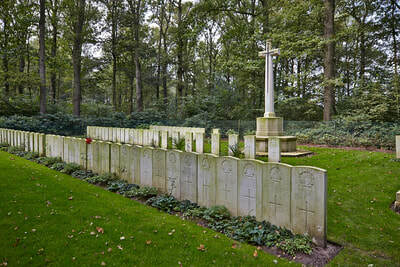 He was buried the same day in a cemetery called 'Dead Horse Corner,' Ploegsteert Wood, and his grave is marked." 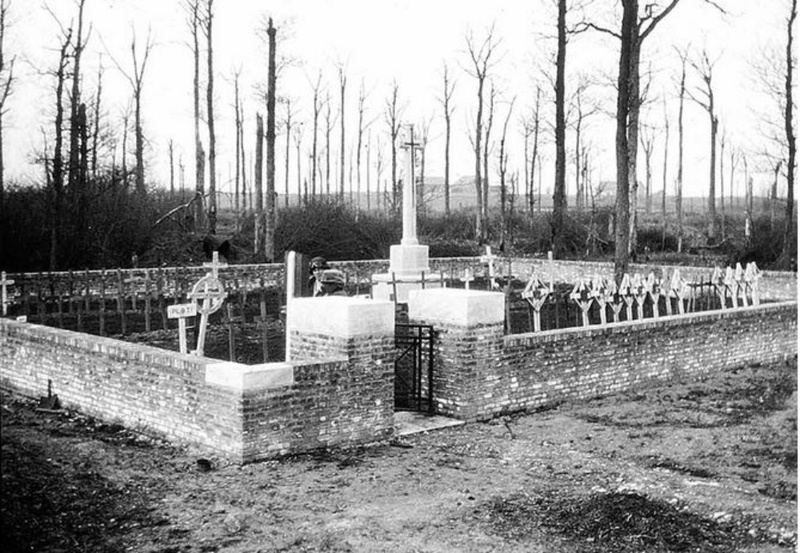 10th June 1917, aged 20. Son of George and Caroline Jones, of 70, Macquarie St., Merewether, New South Wales. 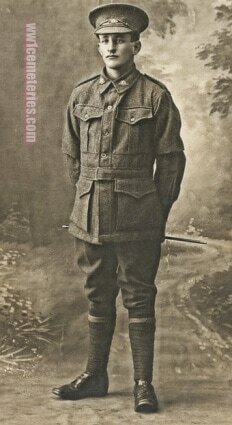 A plumber prior to enlistment Pte Jones embarked with D Company from Sydney on HMAT Beltana on 13 May 1916. On 10 June 1917 he was killed in action at Messines, Belgium, aged 20. A labourer prior to enlisting, he embarked from Sydney aboard HMAT Kyarra (A55) on 5 June 1916. 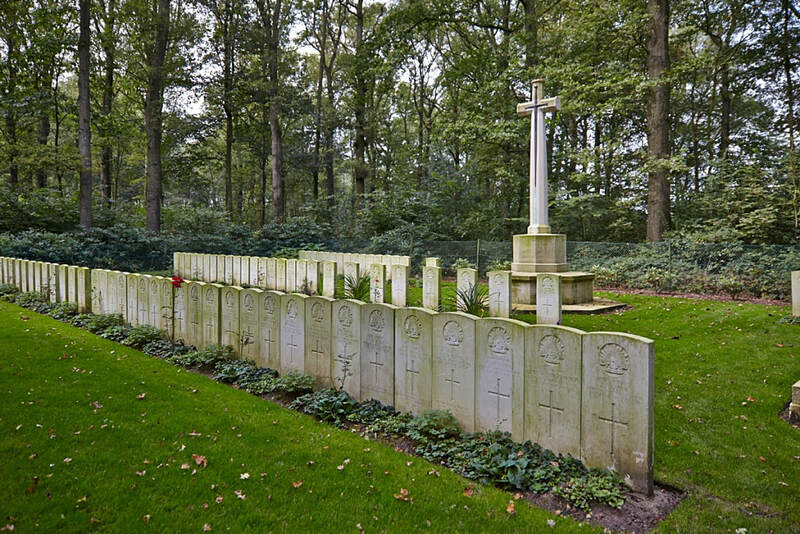 He was killed in action at Messines Ridge, Belgium, near Ploegsteert Wood on 7 June 1917, aged 19. 7th June 1917, aged 30. Son of Margaret Tapper (formerly Luff), and the late John Luff; husband of Mrs. R. Luff. Native of Fremantle Western Australia. On the left is a Studio portrait of 1865A Private (Pte) John Stannan Luff with wife Ruby and children Eric (left) Ron (centre) and May (right). 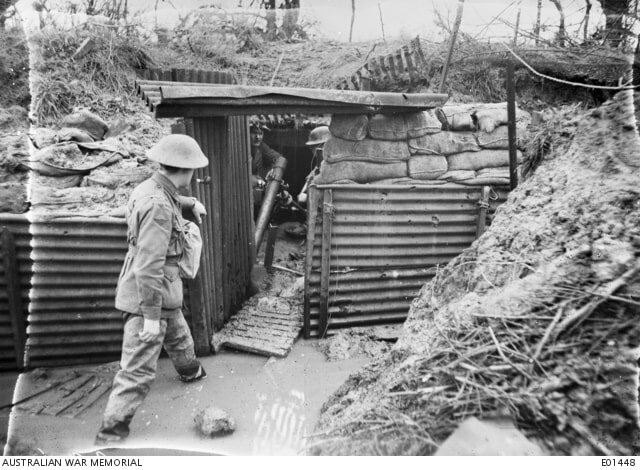 Enlisting in the AIF in March 1916, Pte Luff was a member of the 2nd Reinforcements of the 44th Battalion and was transferred to the 33rd Battalion in December 1916. He was killed in action during the Battle of Messines Ridge on 7 June 1917, aged 30. Son of Michael and Catherine McNamara, of Kentucky, New South Wales. 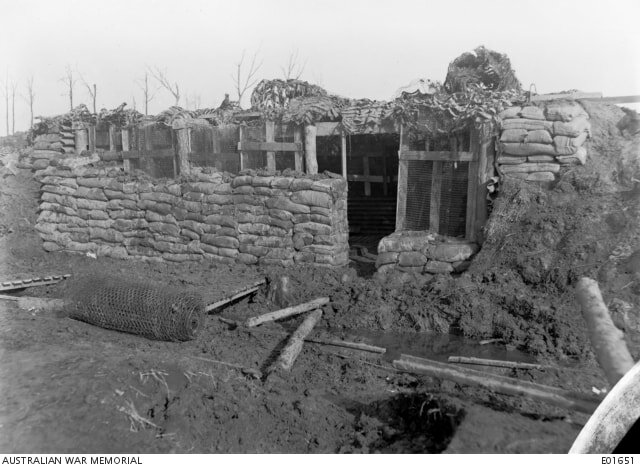 A carpenter before enlisting on 28 March 1916, Pte McNamara embarked from Sydney with the 4th Reinforcements on HMAT Borda (A30) on 17 October 1916. He was killed in action at Messines on 7 June 1917, at the age of 23. 33rd Bn. Australian Infantry. 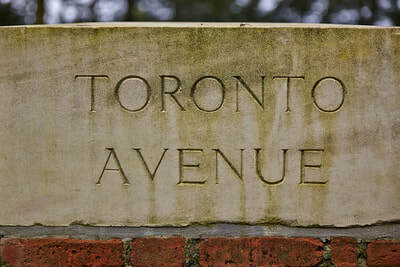 A. I. F.
Son of Alice Carlisle Sands (formerly Montgomery), of 47, Balham Park Rd., London, England, and the late William Montgomery. 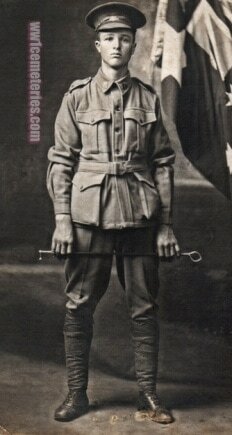 Prior to enlisting George was a farm labourer from Armidale, NSW. "He was killed by a sniper, I saw him knocked. He was shot through the head and lived only a few minutes. It happened near 'Plug Street Wood.' 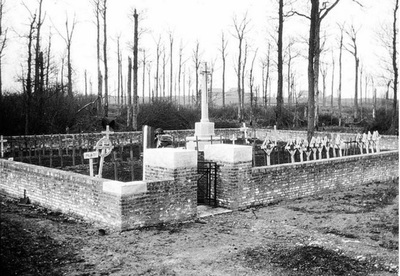 He was buried at the English cemetery near 'Plug Street' Wood. ​Being a "crack shot" himself, George Montgomery was a sniper with the battalion. 10th June 1917, aged 27. Son of Frederick William and Catherine Elizabeth Morris, of Byron St., Inverell, New South Wales, Australia. Native of Totton. 9th June 1917, aged 20. Son of William Alfred and Ellen Johanna Shephard, of Dorrigo, New South Wales. Native of Coff's Harbour, New South Wales. From Dorrigo, NSW. 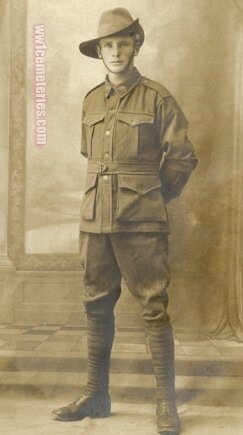 A farm labourer prior to enlistment, he embarked on HMAT Marathon (A74) from Sydney on 4 May 1916. Cpl Shephard was killed in action on 9 June 1917 in Belgium, aged 20. A labourer from Narrabri NSW, Pte Tramby enlisted on 29 May 1916 and embarked from Sydney on 17 November 1916 aboard SS Napier. 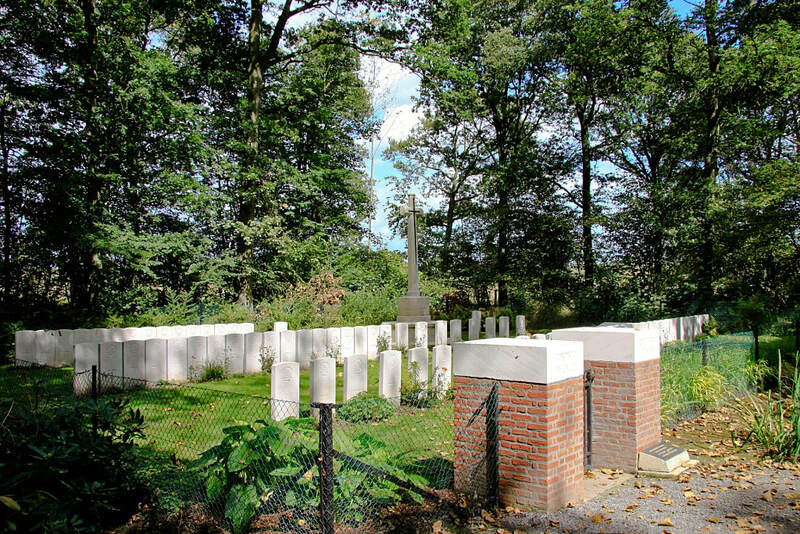 He was killed in action in Belgium on 7 June 1917. 7th June 1917, aged 34. Son of James and Ann Webber. Native of Wyrallah, New South Wales. 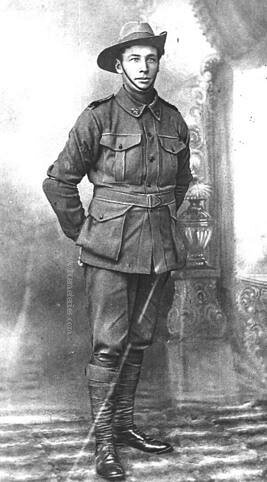 A dairy farmer at Kyogle, NSW., prior to enlistment, Pte Webber embarked with the 5th Reinforcements from Sydney on SS Napier on 17 November 1916. On 7 June 1917 he was killed in action at Messines, Belgium.